I did this painting some time ago but recently I decided to do a few finishing touch ups (actually more then a few) so there’s some heavy and expressive brushwork on it now and it merged quite well with the layer underneath to add more character on the old man’s face, I usually try to keep the original spontaneity and freshness when doing changes like this. 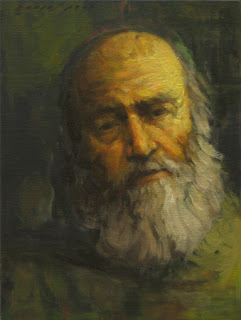 One Response to "The Seer – Art Old man Male portrait Gallery oil painting on canvas"
i found you on blogcatalog in a group discussion and thought to see what you’re making. your work looks nice…. i was pleasantly surprised.